In 2013 Baggage were honoured to collaborate with the wonderful Melbourne playwright Jane Miller to create this lovely, funny, touching and heartfelt work. The Okinawa Hymen Repair Kit Factory has been the economic heart of of Bilston for over 50 years – creating jobs, investing money and supporting the inhabitants. These life changing kits may be controversial, but to the people of Bilston, they are part of the landscape. But things are changing at the factory and the staff are facing what might be their biggest challenge yet. How will they respond to the new owners? What does this mean for Marlene’s correspondence course work? Will Edwin continue to manage the factory as he always has – with kindness and Cointreau? And what of Scott and Charlene, the kit testers – how will they keep fit now? 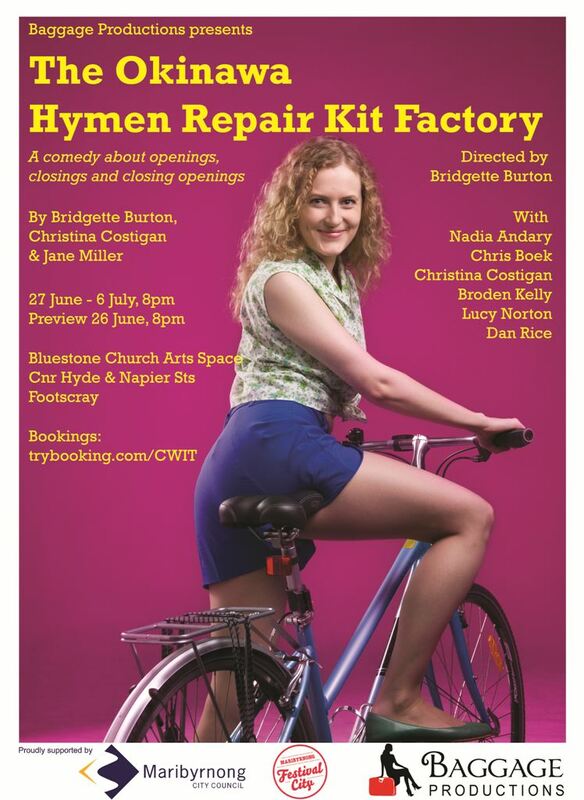 The Okinawa Hymen Repair Kit Factory – a comedy about openings, closings, and closing openings. Written by Jane Miller, Bridgette Burton and Christina Costigan.